I was honored to be among those 18 authors. I wrote about Martin Luther: Reformer of Pastoral Counseling. I excerpted and developed the article from my book Counseling Under the Cross: How Martin Luther Applied the Gospel to Daily Life. Compelled by intense pastoral concern, on October 31, 1517, Martin Luther nailed his Ninety-Five Theses to the door of the Castle Church in Wittenberg. That same day, Luther dispatched a cover letter to Cardinal Albrecht, Archbishop of Mainz, outlining his pastoral care motivation for his reformation ministry. Luther began his letter by expressing his alarm for his flock—many of whom were journeying to the Dominican, John Tetzel, in an attempt to purchase their freedom from guilt. The Reformer then directly addressed the Cardinal. Luther empathized deeply with his flock’s fears because long before he nailed his Theses, he had wrestled personally with the demons of doubt about the grace and forgiveness of God. The thought of standing face to face with a holy God created in Luther a lifelong dread and constant apprehension that he would never find peace with God (his anfechtung). Luther’s agonizing personal search for a gracious God merged with his pastoral care for his confused flock. 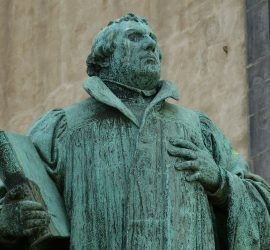 Luther’s personal quest for God’s grace not only animated his personal religious experience, it also motivated his reformation agenda and his pastoral counseling work. While we often see Luther as a theologian-reformer, he envisioned himself as a pastor not only engaged in the pulpit ministry of the Word—preaching, but also in the personal ministry of the Word—counseling. Luther believed that every pastor should be a soul care giver. In his lectures to his students on Galatians, Luther identified the pastor’s calling. Luther never made a dichotomy between preaching and counseling—both were gospel-centered, Word-based ministries. Luther had the same message in his letter to Lazarus Spengler, penned on August 15, 1528. Speaking of administering the sacraments, Luther then outlines the calling and role of God’s minister. Continue reading here: Martin Luther: Reformer of Pastoral Counseling. [i]Luther, Luther’s Works, Vol. 48, “Letters I,” 46. [iii]McNeil, A History of the Cure of Souls, 163. [iv]Sproul, The Legacy of Luther, 280. [v]Tappert, Luther: Letters of Spiritual Counsel, 13, emphasis added. [vi]Luther, Luther’s Works, Vol. 34, “Career of the Reformer IV,” 336. [viii]Luther, Commentary on Galatians, 21, emphasis added. [ix]Luther, Luther’s Works, Vol. 49, “Letters II,” 207, emphasis added. https://www.facebook.com/plugins/like.php?href=http%3A%2F%2Fwww.rpmministries.org%2F2017%2F09%2Fmartin-luther-reformer-pastoral-counseling%2F&layout=standard&show_faces=true&width=450&action=like&font=arial&colorscheme=lightThe post Martin Luther: Reformer of Pastoral Counseling appeared first on RPM Ministries.